Here’s an important signifier of changing times, especially when it comes to the print/digital divide. 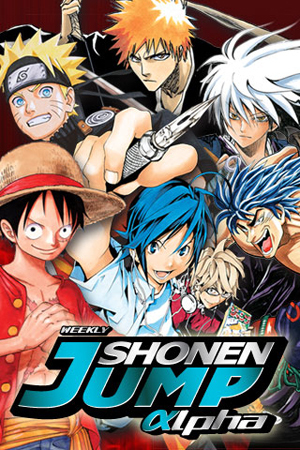 Viz’s monthly manga anthology magazine Shonen Jump has been discontinued in favor of the digital Weekly Shonen Jump Alpha. The online version launched two weeks ago, while the issue cover-dated April 2012 (on sale next month) will be the last in print. The digital magazine is only available in the U.S. and Canada for now, and it requires a Flash-enabled browser or a Viz Manga app to access its approximately 120 pages. Print subscribers have to convert their accounts, but they’ll get three free online volumes of manga for doing so. The biggest bonus is that publishing online allows the company to stay more current with the original Japanese run. The digital manga chapters are scheduled to be only two weeks behind the Japanese print versions (in Weekly Shonen Jump magazine). For the launch, the magazine contains Bakuman, Bleach, Naruto, Nura: Rise of the Yokai Clan, One Piece, and Toriko. Since some of them had to jump ahead in order to match the Japanese serialization, Viz put together a synopsis page (link no longer available) to bring readers up-to-date. (If you’re reading the series in book form, spoilers!) John Jakala has posted a chart showing where the series are in terms of serialization. One of the big draws for print subscribers were exclusive Yu-Gi-Oh! cards included in the magazine. To keep those fans interested, subscribers will be sent those cards free four times a year. It’s $25.99 for a year’s subscription (48 issues, considering some weeks will have double issues). If you only want a particular issue (although considering the serialization, I’m not sure why), it’s 99 cents to get that issue available to you for four weeks. As I write this, there are two preview issues available for free: one contains the first chapters of all of the magazine’s series, while the other is an issue #0, containing the most recent chapters before launch. [Viz has] succeeded in little more than invoking inconvenience to the community as their digital magazine missed the mark; it runs several issues behind and only features 3 of the above series. So long as their product continues to be slow, awkward, and inferior to something a ragtag group of nobodies can churn out in a few hours — fans will continue to look to scanlation groups and aggregators for their weekly fix. Jeez, get some patience, people. Two weeks to go around the world isn’t *that* slow. “Awkward and inferior” I won’t even address, because that’s just self-aggrandization.